Followed by the Rat, the Ox is the 2nd Chinese zodiac sign. Oxen are reliable and strong-willed. Chinese Horoscope signs for Ox are understanding beings who strongly believe that perseverance and meticulousness is the road to victory. They are not the type who takes shortcuts. The see lazy people as unworthy of any ones respect. People from this sign listen to other’s opinions without prejudice. Nevertheless, these people choose to reach on decisions that came from their own explorations. They prefer long-lasting alliances to casual friends. Home is the place where an Ox can find solace, sometimes doing some reading or watching T.V. They are into natural surroundings. Usually, they like spending most of their time at the garden, when they are at home. People from these sign have live longer and are in good physical condition. On the other hand, they have the tendency of working too much. They rarely have time to unwind. Their overall wellness can be enhanced more by doing non-work activities once in a while. Oxen never get tired of doing routine work. They fancy procedural workloads and standout in specialized jobs. These individuals are very particular wit details and have commendable work ethic. Extremely productive when working alone, Chinese zodiac for Ox should have this as a career: broker, dealer, mechanic, draftsman, carpenter, painter, horticulturist, interior designer and army officer. Oxen don’t like socializing much. They hate flirting and small talks. They don’t want to waste their time. This is why they patiently wait for their ideal match since they are not comfortable with constant changes. Usually, relationships with from this Chinese sing don’t last long. However, when oxen understand that relationships involve two individuals and two ideas, then a gratifying match is possible. Metal Ox (1901 & 1961) - Same as metal, Oxen are remarkably powerful. They are industrious and they are willing to do everything to reach their dreams. They can be trusted and depended on. On the other hand, they are not the type who show emotions and are having a hard time showing their true feelings. Water Ox (1913 & 1973) - A water Ox is pretty flexible since they have a distinct quality of being able to comprehend what other people are feeling and thinking. These are very patient, and sincere individuals. Wood Ox (1925 & 1985) - They blend work well as a member of a group. However, their strong sense of principles and confidence, are better suited as a leader. They are easily angered and frank. 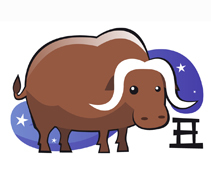 Fire Ox (1937 & 1997) - Chinese Zodiacs signs for Ox who are under the fire element are born leaders. Oftentimes, these individuals hold higher ranks and are well respected, may it be within the community or at work. Oxen from this element have low patience and are very impulsive in making decisions. Earth Ox (1949 & 2009) - These Oxen element are achievers. Their impulsive trait is not dominant. They are very diligent when it comes to work. They have a more humble approach towards others mixed with their trustworthiness and earnestness makes them pretty admirable.